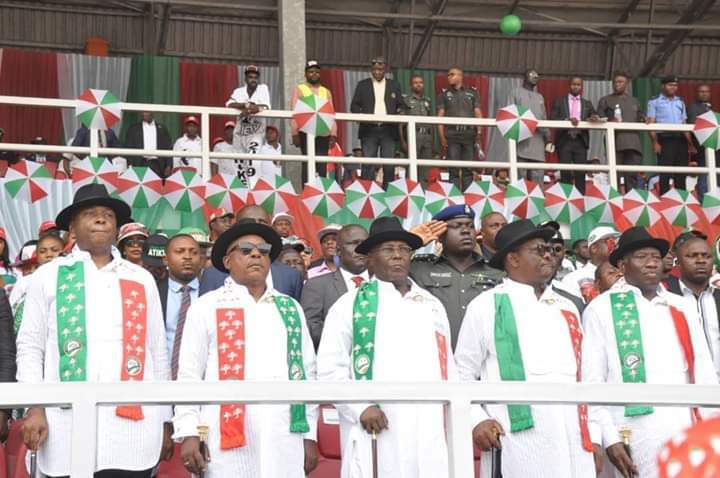 Over Hundred Thousand Rivers people from the the 23 Local Government Areas of the state on Monday formally declared their endorsement of PDP Presidential Candidate, Former Vice President Atiku Abubakar to lead Nigeria out of the woods. “APC is darkness and PDP is light. APC is dictatorship and PDP means freedom. Rivers people have chosen to vote light and freedom, hence all our votes are for the PDP . Rivers State is Atikulated”. He said that rally is a rehearsal for the victory party after the election of Atiku Abubakar as the President of the country. “I will protect the constitution . I will not interfere with the National Assembly because I believe in the Separation of Powers. I will not interfere with the judiciary because I believe in checks and balances. I will uphold the rule of law “, he said. “We are not going to allow anyone to knock our heads and make us fight in this country. We want peace, we want development, we want jobs. We are not ready to fight ourselves again. Any leader who has come to instigate to fight, we will use our ballot papers to throw them out. Buhari must go “, he said. Previous article18 AGDSN Students Thank God For Cheating Death.